If you’re in a sewing business, whether you sew for children or for women, you can impress your customers by letting them know you can “change up” their pattern by making different sleeve styles than just the one that came with the pattern. A basic short sleeve pattern is great, but by changing it to different sleeve types, you can make the entire dress or blouse look different. You can save your customer money by making changes to one basic pattern, and end up giving her a whole wardrobe of designs. Even if you only sew for yourself, you can use YOUR best fitting dress or blouse and change it into dozens of different styles. Let’s start with the sleeve. It’s very easy to change a sleeve into a new style, if you follow a few basic instructions. For this tutorial, we’re going to change the basic short sleeve into a Bell Sleeve. For the sleeve variation, you’ll be cutting the basic sleeve in one or more places, so I would suggest that you reinforce the back of the basic sleeve pattern with iron on pellon, so that the basic sleeve won’t get ripped. When you make the NEW sleeve style, you may want to pin it to pattern paper and cut the new sleeve style, making a new pattern. STEP 1: For the bell sleeve, you will “cut” and “separate” the basic sleeve from the bottom. On the basic pattern, draw in the center vertical line, then measure 2″ to the left and right of the center line, and draw two additional vertical lines. Beginning at the bottom, cut each of the vertical lines almost to the top, keeping the main piece attached at the top. 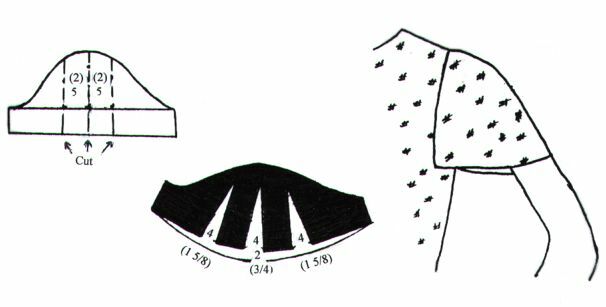 STEP 2: At the bottom of the sleeve, separate the “cut” sections so there are openings of 1 5/8″ between each section, as shown. Lay the basic “cut” sleeve pattern onto pattern paper and pin the sections in place on the pattern paper. STEP 3: At the bottom of the center “cut” line, measure DOWN 3/4″ and make a mark. Draw in the new lower sleeve line with a smooth curving line as shown in the above drawing. Trace around the “new” sleeve pattern on the pattern paper so you’ll have a permanent pattern. We also suggest that you cut out the picture that’s associated with the sleeve style and tape it to the new sleeve pattern, and perhaps even label it “Bell Sleeve”, so you can keep it to mix and match with other necklines and collars for garment variations. This new sleeve pattern / style can be sewn according to the pattern instructions. You can see how easy it is to change the basic sleeve into a completely different style. If you would like to learn how to make TEN different sleeve styles from that ONE basic pattern, check out the sleeve changing class at SewWithSarah.com. The sleeve changing class, as well as others, come in size ranges for plus size/full figure size and average size figures. By offering this service to your customers, you will be able to increase your business and profits. I would suggest that you make sample sleeves showing the new ones that you can make for the customer to see and choose from. Since you’ll be using the sleeve from the customers’ pattern package to make any new sleeves for that particular customer, you can be assured that they will fit her. If you’re sewing for plus size children, you can use the same class to change sleeve styles for children’s patterns. 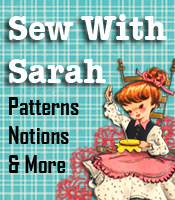 Or Check the website PlusSizeChildren to see additional patterns and pattern making classes for children. How Many Sleeve Styles Can You Make From One Basic Sleeve?